When you’re willing to follow instructions from a Facebook group called “Christian Lives Matter,” you’re already a few fries short of a happy meal. So you will be shocked to discover that after one moron did their bidding to vandalize a mural of George Michael, he was quickly busted and lost his job. Here’s a pro tip: If you’re going to try to destroy a public work of art, perhaps you shouldn’t do it in the middle of the day while wearing your work shirt. It didn’t take long for internet sleuths to track down his employer at Azztek Stone. And it didn’t take long for the company to hand the man his pink slip. Thankfully, the story has a happy ending. While the artist says they will repair the damage done to the mural, some folks couldn’t wait. They painted lovely messages like “Too late. Love Won” and similar messages all over the black paint used to deface the mural. 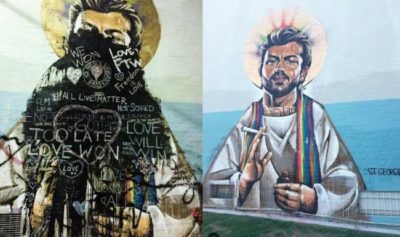 After a vandal attacked a mural of George Michael, local residents returned the love. Another mural, showing former Australian Prime Minister Tony Abbott and Catholic Church official George Pell in an “intimate” embrace beside the words “The happy ending,” was also recently defaced. The same artist did another mural featuring Abbott marrying himself that has not been attacked. A third mural depicts a pair of Kanye Wests kissing.